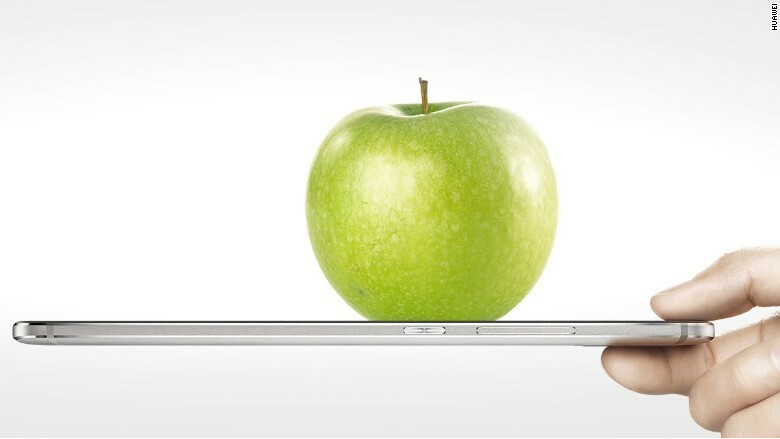 The iPhone 6S may get Force Touch, but Huawei's phone can weigh an orange ... or an apple. One of the most anticipated new features of the next iPhone is "Force Touch," the ability to press down hard on your screen to unlock new menu options. But Chinese smartphone giant Huawei did one better on this week: It unveiled a new phone that can weigh objects directly on the screen. At the international radio exhibition in Berlin, known as IFA, Huawei demonstrated how its new Mate S smartphone could weigh an orange. It's not clear how accurate the scale is. The Mate S said the orange weighed 280 grams, or 10 ounces, which is a super-heavy piece of fruit. Huawei also didn't say what the phone's weight limits are. (You probably can't step on it every morning in your bathroom.) Also, the utility isn't immediately obvious. How often do you need to weigh small objects on the go? But the technology is cool and intriguing nonetheless. Force Touch is a clever way at maximizing real estate on a small screen, such as a smartphone or smartwatch. It allows app makers to hide menu options in the background, only displaying them when someone pushes down hard enough on the screen. For instance, the Mate S allows people to zoom in on their screens, preview photos or make special moves in games using Force Touch. Apple debuted Force Touch on the Apple Watch earlier this year, giving apps the ability to display full-screen images without wasting precious space with gear or "hamburger" icons for settings. Apple (AAPL) hasn't commented on what Force Touch might be used for on the new iPhone 6S (or whatever it will be called). It's unlikely that Tim Cook will weigh an apple on stage using an iPhone 6S, but you never know.